Family members try to find out situation of Loxicha prisoners in two consecutive transfers. 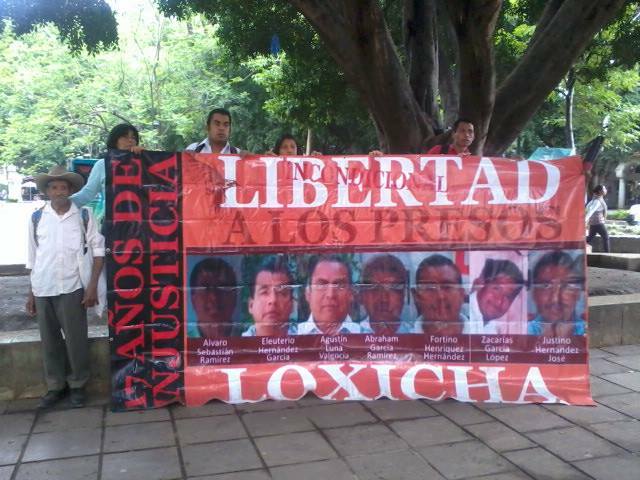 At 2:30 in the morning on June 7, the political prisoners from the Loxicha region in Oaxaca were secretly transferred to the prison known as the Federal Social Reinsertion Center* (CEFERESO) # 13 in Mengolí de Morelos, Miahuatlan. Álvaro Sebastián Ramírez, Abraham García Ramírez, Agustín Luna Valencia, Eleuterio Hernández García, Fortino Enríquez Hernández and Justino Hernández José were violently pulled out of their cells and shipped out of the Ixcotel prison in two tourist buses and Zacarías García López was removed from the Etla prison. The men have been locked up for 16 years, accused of belonging to the Revolutionary People’s Army (EPR) and convicted of the death of federal police in a 1996 shootout in Huatulco, Oaxaca. All are activists who have worked in their communities, defending their traditional way of life and their lands against plunder, repression, and the militarization of the Loxicha region. When news reports first came out about their transfer, the Central Prison Bureau told family members that the prisoners had indeed been transferred and that their destination was “probably” Miahuatlán, but for two weeks they were prohibited from visiting them to find out exactly where they were and what their physical and mental state was. Consequently, their family members denounced the transfer as a case of forced disappearance, holding the state government under Gabino Cué and the federal government under Enrique Peña Nieto responsible. On June 20, after a newly formed Accompaniment Brigade of family members and supporters marched to the prison, they were finally allowed a “visit” with no physical contact through a TV screen with the prisoners at Mengolí. But a day later the entire harrowing process began again when three of the prisoners were transferred to the recently revamped CEFERESO # 13 at Huimanguillo in the state of Tabasco, far from home. Now all seven of the Loxicha prisoners are there, once again considered disappeared, and yesterday, June 25, the Brigade set out to find out exactly where they are and what their situation is. The penitentiary at Mengolí de Morelos, Miahuatlán, officially classified as a medium security prison, is part of a prison construction boom in Mexico that follows the United States model of supermax prisons under the pretext of relieving overcrowding in state prisons where some federal prisoners have been held. At recently inaugurated Mengolí, for example, there are cells designed for isolation that only hold a maximum of two people. The only option for visiting is through a “TV conference” by telephone. One of at least 8 federal prisons built under the regime of former Public Security Minister Genaro García Luna during the presidency of Felipe Calderón, the new prison has been denounced as “Oaxaca’s Guantánamo” according to Agencia Subversiones. Since then, family members have learned that all the prisoners have been transferred out of state and are faced once again with the anxiety and uncertainty about the treatment of their loved ones. So far, little information has not yet come out about conditions in the prison in Huimanguillo, Tabasco, but one thing is sure: If the maximum security CEREFESOs have formerly been labeled “extermination camps” by the Cerezo brothers and other political prisoners, the situation is tremendously worse now that Mexico is following the path laid out by the most monstrous prison nation in the history of the world and big businessmen in Mexico have discovered the gold mine of the private prison business. *Formerly called “rehabilitation” centers, the term now used is “reinsertion,” which implies, among other things, the cold-blooded requirement that if and when prisoners return to society, they will be expected to pay for the costs of their imprisonment.